The Doppler effect is a change in the frequency of a wave which occurs if one is in a different frame of reference from the emitter of the wave. Relative to us, we observe such a change if an emitter of a wave is moving relative to us. This value is known as the red-shift of a star, denoted z. If z is positive, the star is moving away from us - the wavelength is shifted up towards the 'red' end of the electromagnetic spectrum. If z is negative, the star is moving towards us. This is known as blue shift. Note that we have assumed that v is much smaller than c. Otherwise, special relativity makes a significant difference to the formula. 1. M31 (the Andromeda galaxy) is approaching us at about 120kms−1. What is its red-shift? 2. Some light from M31 reaches us with a wavelength of 590 nm. What is its wavelength, relative to M31? 3. Some light has a wavelength, relative to M31, of 480 nm. 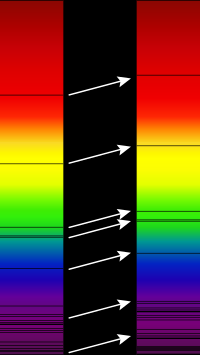 What is its wavelength, relative to us? 4. A quasar emits electromagnetic radiation at a wavelength of 121.6 nm. If, relative to us, this wavelength is red-shifted 0.2 nm, what is the velocity of recession of the quasar?